Over the past year, fatal accidents and near misses on the A605 have increased sharply. Many drivers and passengers have lost their lives, and it seems there are narrow escapes from major accidents weekly. Hardly a month goes by without an accident on this dangerous road. 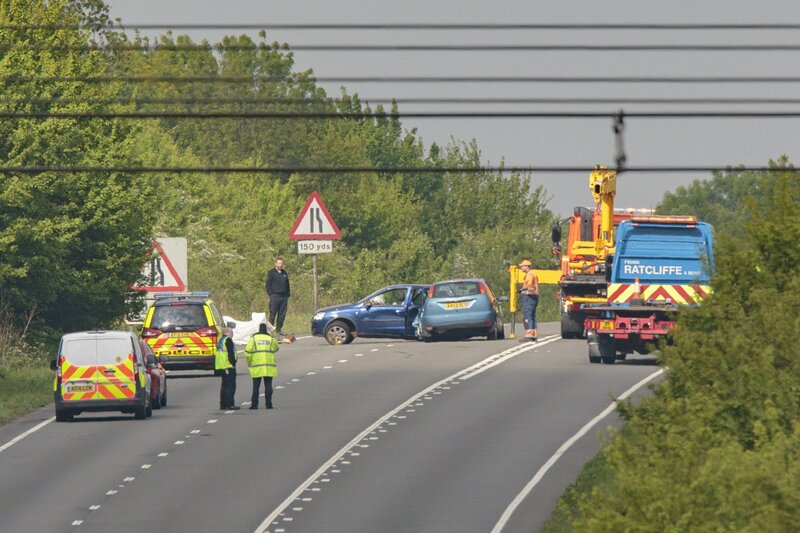 On January 3 a serious collision shut the A427 at Oundle and caused long delays on the A605. Furthermore, Station Road was closed in both directions following a crash involving a motorcycle, in which there were no serious injuries. A single vehicle crash took place on February 10 on the westbound carriageway between Elton and Haddon. A Magpas air ambulance had to land at the scene along with fire crews and ambulances. A man caught up in the accident had to be cut free from the vehicle and treated at the scene by paramedics. He was later taken to Peterborough City Hospital by an ambulance. He sustained serious head and neck injuries. A teenager was arrested after a crash on May 7 killed two men and seriously injured two others who were immediately taken to hospital in Cambridge. The 19 year old was arrested for causing death by dangerous driving, and serious injury by dangerous driving. The road was closed between Haddon services and Elton, in both directions for 18 hours before reopening. On May 11, Josephine Booth, 82, was driving a Nissan Micra when she was struck by a UPS lorry on the A605 at the junction at Elton. Mrs Booth was airlifted to hospital, and later died in hospital. Paul Cooper, 51, was driving a Peugeot Partner, on July 27, which was involved in a collision with a Suzuki Vitara and a Peugeot 208. Due to the severity of the crash Mr Cooper was pronounced dead at the scene. On August 18, an off-duty police officer was killed when his Ford Focus was hit by a Scania lorry on the A605 close to Elton. On 24 November, a two vehicle crash at the Elton junction caused long delays, but fortunately, no casualties. The A605 between Thrapston and the A1 has had a shocking road safety record. Many attribute this to its narrow single lane roads running very close to one another. There are few overtaking zones or bays for drivers to safely overtake or have the chance to rest. Furthermore these lanes are not adequate for the high levels of use by lorries and cars. Crucially, there is no speed limit checking process along this road, which allows cars to drive at high speeds without risk of being caught. A Press Association freedom of information request revealed that Northamptonshire turned off all its speed cameras in April 2011, but left the structures in place to discourage speeding. Installing roadside bays for long haul or late night drivers, and overtaking areas at frequent points along the roads, as well as working speed cameras with limits fluctuating according to traffic levels may be a necessary outcome. All these changes put together could improve driver behaviours and could eliminate the accidents that are occurring far too often on the A605. Shailesh Vara MP, North West Cambridgeshire, whose constituency includes the Elton junction, has taken up the A605 road safety record with a couple of hard hitting letters, requesting investigations and some positive action in response to these road accidents, with Cambridgeshire County Council (CCC). Tom Pursglove, MP of Corby and East Northamptonshire, has also raised these issues and is working closely with Mr Vara to improve the state and minimise the accidents occurring on this road. Writing in June to the Secretary of State, Mr Vara said: ‘The A605 needs to be given priority in the wake of recent tragic events and I would be grateful if officials from your department could work with officers from Cambridgeshire County Council to see what action can be taken to mitigate risks in this area.’ Mr Pursglove has also contacted CCC, and has requested a meeting with the Department of Transport. In a letter of 30 October to the MPs, the CCC said that whilst concerned, they have concluded that these accidents were not caused by ‘highway related factors’. Chief executive, Gillian Beasley, wrote, ‘They [the CCC] have pointed out that the current spate of accidents follows a 5 year period during which there were no recorded fatal injury accidents’, so the road is not yet categorised as an ‘accident cluster site’. This might change once police data is analysed in June 2018. She explained that although road policing resources are under considerable strain, they are working to determine how they can improve and increase ‘an enforcement presence’ to reduce speeding and poor driving by motorists.